You may need to take action to keep your bank, mortgage, credit card, and property management account links active and healthy. Stessa becomes exponentially more powerful once you securely connect your financial accounts and begin to import transactions data automatically. These secure data links are set up and managed via your Data Sources page. To set up a new bank, mortgage, or credit card connection, follow the instructions in Linking Your Financial Accounts. 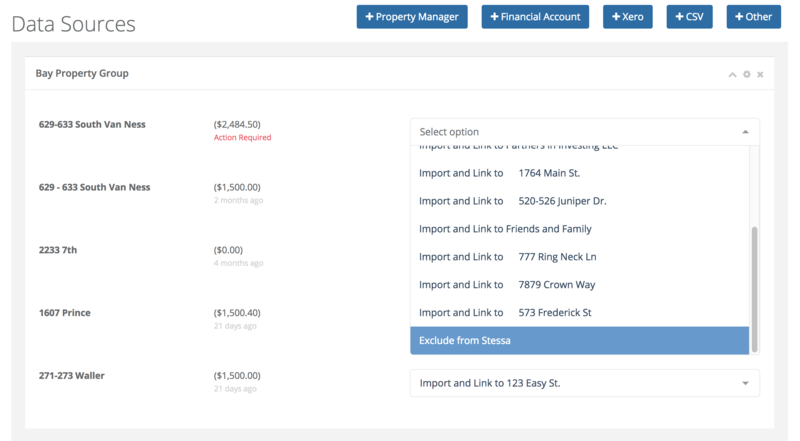 To set up a new property management connection, your PM will need to be using AppFolio for owner reporting. If that's the case, follow the instructions in Connecting Stessa to AppFolio. Once Stessa has established a secure connection to your financial institution, you'll need to assign each connected account to a specific Property or tell Stessa to exclude it from automatic data imports. Note that this assignment is required for each account as you may have more than one account for each financial institution. By default, Stessa will automatically import all available transactions data from the past 12 months unless your financial institution chooses to make less data available. All accounts associated with Properties and all unassociated accounts not already "Excluded" will be subject to automatic data imports. If you use a single bank or credit card account for transactions involving multiple Properties, you'll want to set that account to "Import and Review." This will allow you to assign transactions imported from this account to whatever Property you like on a one-off basis via your Transactions page. As mentioned above, Stessa will automatically import all available transactions data from the past 12 months unless your financial institution chooses to make less data available. All accounts associated with Properties and all unassociated accounts not already "Excluded" will be subject to automatic data imports. If you use multiple financial accounts to manage a single Property, just repeat the Property selection for each relevant financial account on your Data Sources page. There's no limit to how many financial accounts you can associate with a single Property. If you want Stessa to ignore certain financial accounts, you'll need to set them to "Exclude from Stessa." Once completed, Stessa will prompt you to either delete or preserve past transactions data associated with the newly excluded account. If Stessa doesn't support connecting to your financial institution or wasn't able to link a particular account, you can do a bulk import of transactions data monthly or quarterly to stay current. To learn how to do this, follow the instructions in Upload Transactions Data (QIF, CSV). Still have questions about managing data connections? Use the blue circle at lower right to drop us a note. We'll get back to you shortly.